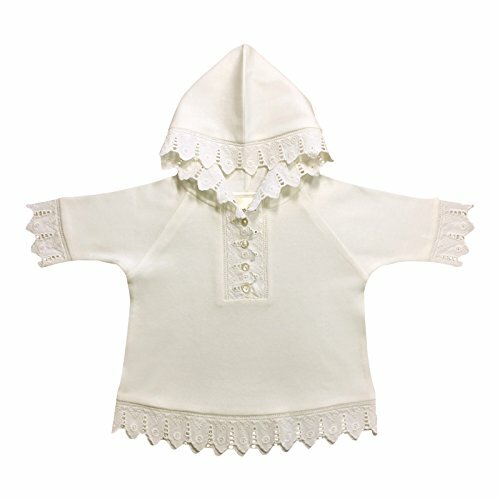 A perfect birthday or holiday gift is the heirloom-style infant Toddler Hoodie by Victorian Organics. The soft, antique-style little girl shirt is inspired by the Victorian era, and just right for the her to wear with Victorian Organics matching Bloomers or Pantaloons, which are sold separately. The front placket is made out of lace, with mother of pearl buttons peeking through the eyelet holes of the lace design. The hood and placket opening makes the shirt easy to pull on and off, especially if the buttons are left unbuttoned and it is put over an undershirt. The classic lace trimmed long-sleeved shirt is comfy, and cut loose with a hood. Ariadne designs new children's clothes made of organic cotton knit with 100% cotton eyelet lace trim that will make everyday special, and special occasions a natural occurrence. This old-fashion, vintage-style garment is just the fashion for Holidays, birthdays, costumes, fairy tale looks, charming keepsake baby photos, and family portraits. Shrinkage is allowed in the sizing of the garment to allow for hot temperature machine laundering. It's helpful to use a lingerie bag when machine washing to keep the garment looking new. To dry the garment you may choose to hang it on a hanger or lay it flat, and finger press the wet lace to smooth the wrinkles out. If using a machine clothes dryer it is recommended to dry the garment with low heat and press the lace with a hot iron. Many people who prefer hot machine laundering for babies, don't mind the natural look of the wrinkled lace after throwing the garment into the dryer, but the garment will look like new If the lace is pressed.